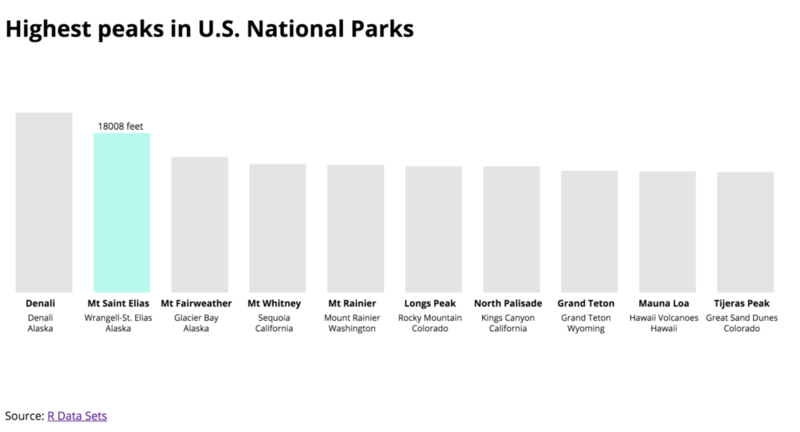 Highest peaks in U.S. National Parks. For this week’s assignment, we were to use d3.js to create a simple graph. I decided to work with a data set I found at R Data Sets that included information about the highest points in national parks. See the interactive graph here. I decided to start with a simple animation using the .transition() tool in d3.js. I also created two functions, mouseenter and mouseleave, that are triggered when you hover your mouse over each bar of the graph. See my full code here. Previous Previous post: Project update: Plastic in paradisum.